I enjoy my coffee to the point of being a tad bit obsessed; I will drink it in the morning and in the afternoon. I have even been known to drink coffee at night before bed. Since I am a daily coffee drinker it is important for me to use every bit that coffee has to offer. In the mornings I sit on the porch with my cup of joe, inhaling the sweet nutty aromas and watching the song birds find worms in the garden. Thoughts and ideas always come to me in the morning while I am awakened by my cup of deliciousness. I imagine my love for coffee and gardening were inherited from my great-grandma. I get so excited when my plants sprout up or when plants I thought were dead, come back to life. I think of myself as a resourceful problem solver; I believe that everything has more than one purpose, including coffee and K-cups. I have used coffee grounds in my plants, providing them with nutrients. Adding coffee to your compost will add nitrogen to your pile, you will want to add brown compost material to balance out the green compost that coffee provides. I have started to use the K-cups as seed starter pods; they already have the perfect shape and a hole in the bottom for proper drainage. This method also eliminates waste from landfills. This method also works for small garden areas, such as an apartment patio or Assisted Living Community. Currently the Keurig Vue series pods are fully recyclable. Other pods can be recyclable if the liner and aluminum foil cover are removed. Personally, I want to use things as much as possible before sending them to the landfill or recycling center. Some people don’t have a convenient way to recycle, and others for their own reasons do not recycle. When this is the case, reusing is a great way to make a difference in the home and around the world. The K-cups that do not get recycled will take thousands of years to decompose in the landfill and these plastic pods will contribute to our growing problem of plastic pollution. There are plenty of options to avoid being a contributor in the growing landfill problem. Originally these plastic pods were created with the design that they would not be reused, just thrown in the trash. I want to change the way we view “trash”, because you never know what treasures you can create. Until K-cups are designed to be compo-stable, we can use them as the perfect home for our seeds. Once your coffee is brewed and you will remove the K-cup from the Keurig, you will take the coffee out of the inside and sprinkle it around your plants or add it to your compost. Once the coffee is emptied the liner should be removed. I usually throw away the foil top and the liner; I am would love to find a use for these too though. I rinse my plastic pod after removing the liner because I love when the container looks nice and new. If the container is clean it also makes it easier to paint your plastic pod; you can use spray paint and have a nice colored pot for your little seed. I believe acrylic paint would work too, I happen to like the way spray paint has a clean finish and shine. When my emptied K-cup is ready to be reused, I fill it with dirt and plant my seed inside. I water my seedlings daily (or as recommended) with a spray bottle so they are not drowning in water. The hole in the bottom of the K-cup allows for drainage. When your sprout begins to take root, the roots may come out of the bottom. I wait for my plants to get their secondary leaves before replanting. With the plastic pod seed starter pot, the roots were holding the dirt together nicely, making for easy removal and transplanting. 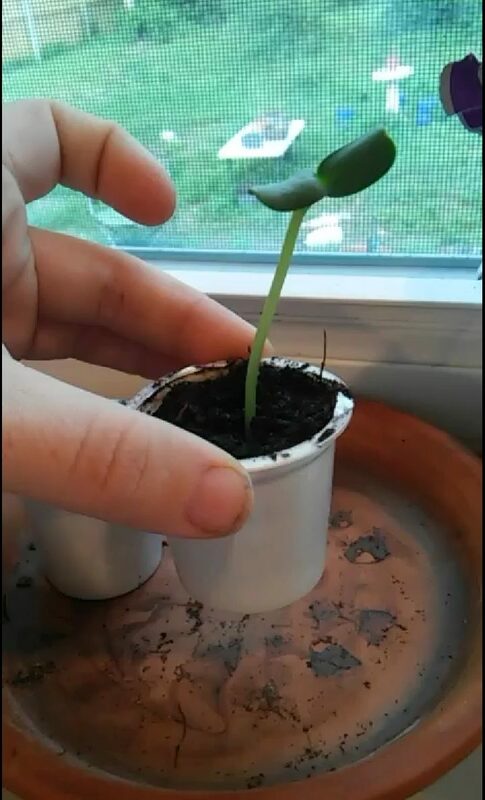 The seeds I used for my first K-cup seed starters were mammoth sunflower seeds. I used one seed per pot and I planted about six of the seeds. Three of the seeds have survived, two have their first flowers and one is beginning to bud. I am a proud mammoth sunflower mommy. My hydrangea was dying, it looked like a stick in the ground. I added some organic unflavored coffee grounds to it, watered it daily and within a month I had a beautiful luscious plant. Once the plants outgrow their K-cup, I usually transfer them to a small/medium size cypress planter. Since cypress wood is rot and pest resistant, it’s great for garden planters. 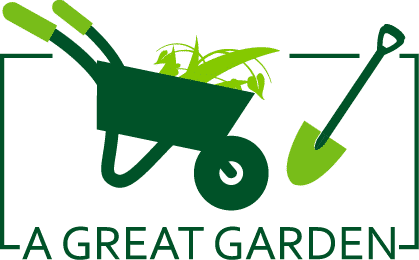 I usually get mine from Dirt Don’t Hurt Garden Company, a small local business created by other savvy gardeners. Initially, I was skeptical about the successful outcome of using K-cups as seed starters. After trying it out and having successful flowers, I don’t foresee myself buying seed starter pots anymore. After every coffee, I empty the contents of the K-cup and then I store them in a box for future gardening use. I may not be able to solve the landfill problem of the world, but I can contribute less to the pile. While collecting these pods to reuse in my garden, I realized there are probably other items I am throwing away that could be re-purposed. The idea of K-cup seed starters has given me the ability to inspire others, inspire myself and grow my garden. 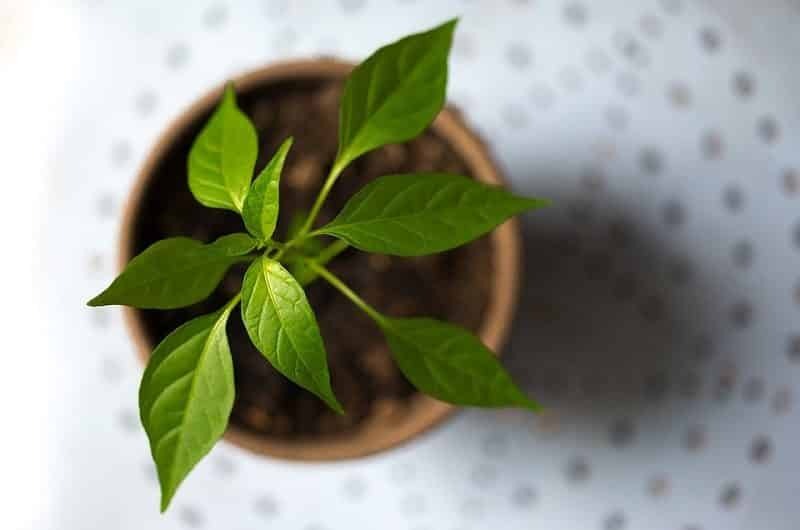 How to Grow Cannabis with Grow Lights?